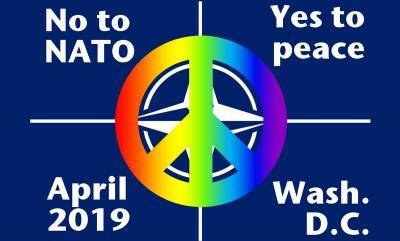 The North Atlantic Treaty Organization (NATO) is coming to Washington, D.C. We’re organizing a peace festival on April 3 to unwelcome them. We'll munch on vegan food, make art, boogie down to live music, and hear from keynote speakers like comedian & activist Lee Camp, with nonviolence protest training provided by Nadine Bloch of Beautiful Trouble, in preparation for big demonstrations the next day, April 4, outside NATO's meeting. NATO is the largest military alliance in the world with the largest military spending (roughly three-quarters of the world total) and nuclear stockpiles. Instead of celebrating NATO's 70th anniversary, we're celebrating peace, in commemoration of Martin Luther King Jr.'s speech against war on April 4, 1967, as well as his assassination on April 4, 1968. Food by DC Vegan Catering. For questions or more info, contact Greta at greta@worldbeyondwar.org.